We have focused our attention on clarifying what should be in our Sites’ collections, rather than simply thinking about what shouldn’t be. By thinking more strategically about what we have collected and why, we try to improve our vision about what the collection should be. Our approach has been that any discussion, consideration, or thinking about removing collections from the museum should first start with an examination of the strategic plan for the site, the interpretive and programmatic uses of the site, and the relevance of the collections to the site’s strategic framework and interpretation. She then provides some examples of particular challenges facing collections at National Trust Historic Sites, including the “never should have been accessioned in the first place” object; pieces with a provenance to the Site that are still appropriate for deaccession; destruction by neglect; and too much of a good thing (I bet these will sound familiar to you) and debates whether funds from deaccessioning can be used for the care of historic buildings, not just objects, at historic sites. 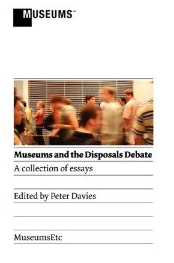 More details on Museums and the Disposal Debate is available from MuseumsEtc and since it’s published in the UK, you might want to buy your copy through Amazon.com. I agree with your suggestion that “we may be going backwards” in reverting to earlier use practices at historic sites, such that the supposed “new” models that are being advocated in some places represent nothing new at all. Other ideas of “newness” that involve community- and amateur-generated exhibits/programs and “affinity” groups also bear a striking resemblance to older historic site and historical society models. Before we embrace the old as if it were “new,” we need to look very carefully at the problems the old models caused, which generated both the need and desire to professionalize the field. Issues of sustainability and community engagement are issues that we should and must face today, but I don’t think museum professionals or historic preservationists should suggest that we follow “cutting edge” ideas that are actually throwbacks.